Questions and Answers about Tony and what’s going on here at home. I try and update everyone on facebook when I have news from Tony. Usually is bummer kind of news like, he’s sick or worried or stressed out. So, I’ll try and go into some details and update you all on how things are going. So, whats Tony up to? Well, he’s learning a lot about leadership, how to receive and give orders, he’s learning navigational skills, and practical stuff like shooting, weapon safety and so on. This week he’s been learning about leadership and his platoon (55 guys and gals) are gearing up for their big leadership test thats coming up in the middle of april. When he calls, he’s usually set up something to be doing like cleaning his cubicle, or polishing his many different pairs of boots. He’s probably more organized than I am at this point. He tells me how his day went, he brags about how much carrot cake he can consume and that they are going to see a movie on the weekend. The first 4 weeks were not like this. The guys were in their “indoctrination”period, which means they were restricted to certain parts of the base, couldn’t leave and went from a pretty relaxed life style to one with a million rules and restrictions. The first 2 weeks were very hard for him. He explained that during that time he couldn’t see the light at the end of the tunnel. He was away from us, exhausted and “omg what have I gotten into” mind set. Now, things are easier – not easy though. Nothing is ever easy out there, it is basic training, its gruelling. Given that they’re in close quarters with each other and 1500 other guys, sickness spreads like wildfire. He’s had a wicked chest cough cold thing, and once he got over that, he got tonsillitis. So, try being in basic training and being sick and getting little rest. Its gross. I pray a lot about his health and safety. So, timeline? This is subject I get a lot of questions on. When is he done? Where will you guys be living? Ahhh if only I had all the answers. So, I will tell you some of what I know. His basic training ends on April 24th as long as he doesn’t miss any time or injures himself. If he misses anything due to illness or injury, he’s recoursed, which means he will have to join up with another platoon when they get to about where he left off. That could take a while, so we’re praying hard that he can just get this done without any problems. So, that’s just basic training. He also has to do 5 months of his trades training (his actual job training). We don’t know yet when that will start, and it could take a couple weeks or months before he begins that. So, in the meantime, he would be posted to a base to work there until his formal training begins in Kingston Ontario. He got to pick his top three bases he could be stationed at for that in between period, but theres a possibility he could be posted elsewhere. We’re hoping he can be in Chilliwack for that time. Are you going to Ontario with him while he’s doing his formal job training? No, we will be in chilliwack until he’s finished. Then he’ll be posted to a base and we’ll all move out to be together again somewhere. Yeah, we also have no clue where that posting might be. There’s a lot of unknowns right now, so for Miranda the planner, its hard, but I’m dealing with it as best as I can. Also, I flew out to see him last weekend. 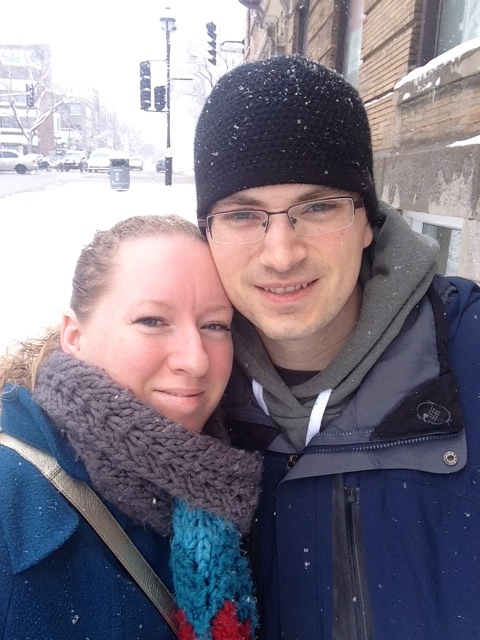 Yup, we agreed it was a good idea to have a weekend getaway in Montreal. One of his friends has an apartment in downtown Montreal, and he has been trying to sell it for months, so its all furnished and fancy and he gave us the keys for the weekend and we got to relax and hang out. It was a very good decision. We ate delicious poutine and saw a movie. Did a lot of walking throughout the city. Montreal is very pretty. I could totally see myself living there (much to the dismay of my parents). It snowed the entire time! How are the kids doing? They were pretty sad that I was going out to see daddy. The plane tickets were too expensive for bringing both kids. Lucas seemed more sad about not being able to fly on an airplane. They have been doing rather well, but they still have hard days. Lucas has told me twice now (during the last 2 months) just out of the blue that he lost his daddy and cant find him. I cried. Had to reassure him that daddy wasn’t lost, just working far away where they’re having lots of snow. They skype with him on weekends and talk on the phone. I tell the kids about what he’s doing, learning, marching and so on. The kids pray specifically for him to have good inspections and to get well, and then add things like “help daddy’s knees feel better” and stuff like that. Sadie gets things more just because she’s a little older, but Lucas is still trying to figure stuff out. While driving in the car, he pointed to the mountains and exclaimed “LOOK MOMMY, THERES SNOW ON THE MOUNTAIN, THATS WHERE DADDY LIVES!” Still a bit hard for him to understand still. We haven’t had to give out a lot of daddy presents, but they still get them for holidays and hard days. They’ve been having special sleepovers at their aunty’s house and we do frozen yogurt at Yummi’s occasionally. So, we’re all doing ok right now. Just keep Tony in your prayers as he’s still fighting off sickness. I hope this has helped answer some of your burning questions and I hope that some of my facebook statuses are less confusing or vague.